Sorry for the lame posing and the yellowish beard, but I'm on vacation! Just picked up my two polos, so glad that the Swedish post found their way to this small village in the middle of nowhere, thanks for sending them here Simon. Awesome stuff! Really love the material, and they are thicker than I thought they would be which is great. Well done Simon! Yes, they are quite thick but they breathe a lot too. 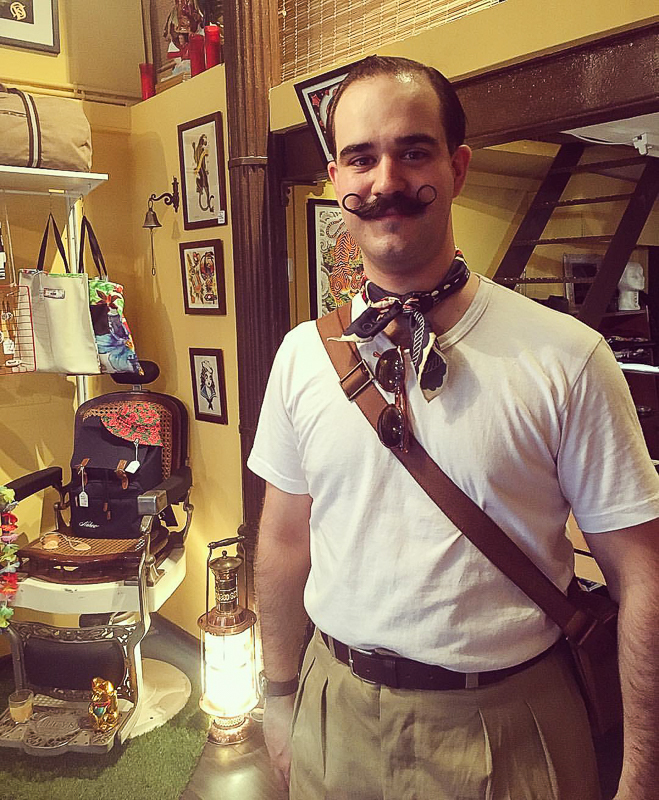 I went to a local shop today to buy some moustache wax and the lady asked to take a picture of me for their instagram. I was wearing the SJC bandana, Real McCoy's tee and the french khaki shorts. (07-28-2016, 07:05 PM)willyto Wrote: Yes, they are quite thick but they breathe a lot too. Exceptional, sir. Your whiskers are superb too. I was a member of the Handlebar Club until 18 months ago. Since then I've alternated between a pencil style and a beard so now I'm just a Friend of the Handlebar Club. It will make a return for the AGM next year though, to celebrate the club's 70th anniversary. A few days back. LVC "spring-bottom" pants, discharge printed indigo linen shirt from next or someother godawful high street chain (charity shop find). They look great on you! I'm glad you bought the jeans. Thanks for alerting me to them, G! Those LVCs look superb... 1880s/90s design? Are the lined? That cuff and then hint of stripe at the ankle looks interesting. Early 1900s, apparently. They were work pants intended for the more clerk/shopworker rather than mineworker type of worker. They are quite flared, less so with the turnups. Not lined, but striped linen "double curtains" in the waistband. Jings, that's quite an apparent flare when you see them flat, doesn't show in the photo. I think I'd prefer mine a lot straighter, but still cool. What's the thing in the spring name - is it to do with the shape of the hems - looks like the back piece is much larger than the front of each leg? It's just referring to the flare. They spring out at the bottom. 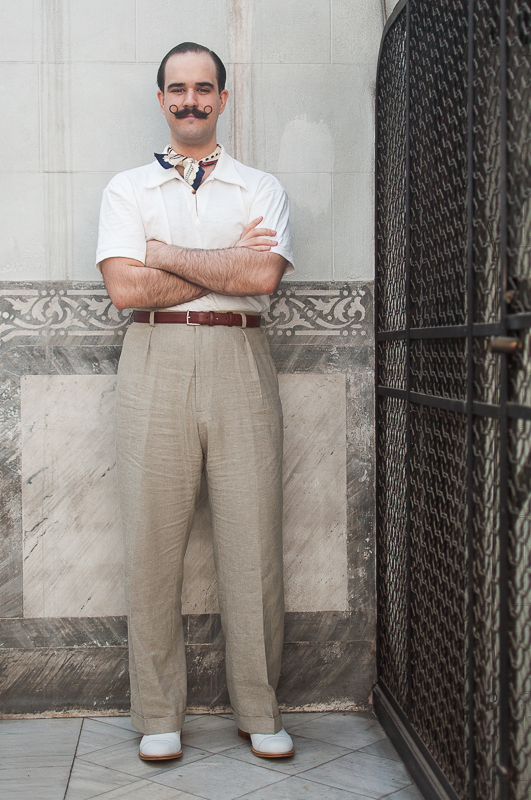 These linen trousers feel like pajamas, so comfortable and perfect for summer. Nice trousers, checking out Scott Fraser. (08-13-2016, 01:22 PM)metatron Wrote: Nice trousers, checking out Scott Fraser. He's definetely worth checking out. He's catalog isn't big but the items he produces are of very high quality. I have two more trousers in wool fabric for autumn/winter in the same cut and size.